I am starting to believe that the hardest music to make successfully is ambient. Just think about it, music that is minimalistic and repetetive, and you have to craft it to be interesting. In this double header I am taking a look on two Ambient releases. 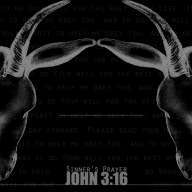 In this review: John 3:16 – Sinner’s Prayer and in the first part Hu Creix – The Present Forward. Both artists quite succeed in this trade, both with a fine release, but in the end fall in the same loophole. What is it? LENGTH. The release is best described as Psychedelic gospel ambient and hell, is this quite a mixture! Very original sound with surprising heaviness, chilly yet chilling soundwaves and odd vocal samples. Did anyone mention Twin Peaks? Fortunately, the second track has an awestrucking Lynch-esque start. Nearly dropped me out of my chair. It is a remix and I don’t know how much it borrows from the original Fluid song, but the melody is something i would love to hear in a great movie. Both artists definitely know how to spice up slowly transforming songs by adding new interesting sounds. But when it comes to full songs, they only have a couple songs that are spot on and without a significant weak spot. Albums that have a lot of merit but in the end work best cropped.